Trim the salmon and cut into four even portions, combine the gin & tonic and place half of the mixture, peppercorns & a few sprigs of dill in a deep container with the salmon and leave for 3-4 hours to marinate. Peel the cucumber and place half of it along with a splash of gin & tonic into a blender and blend until completely smooth, pass through a fine sieve and set aside. Cut the remaining cucumber into slices approximately 1cm thick, pour the remaining gin & tonic over, cling film and place to one side. Gently warm a heavy frying pan with a little vegetable oil, remove the salmon and allow excess liquid to run clear. Once the pan is hot place the salmon, skin side down applying gentle pressure to the skin, this will allow an even cook and add a crispness to the skin. Once the salmon begins to appear cooked on the sides above the skin gently turn over. Add a generous knob of butter and baste the fish for another 2 minutes. Remove from the pan and allow to rest for a couple of minutes. Whilst the fish is cooking, place the sliced cucumber under a hot grill to colour the outsides, for best results we char the outside using a blowtorch. 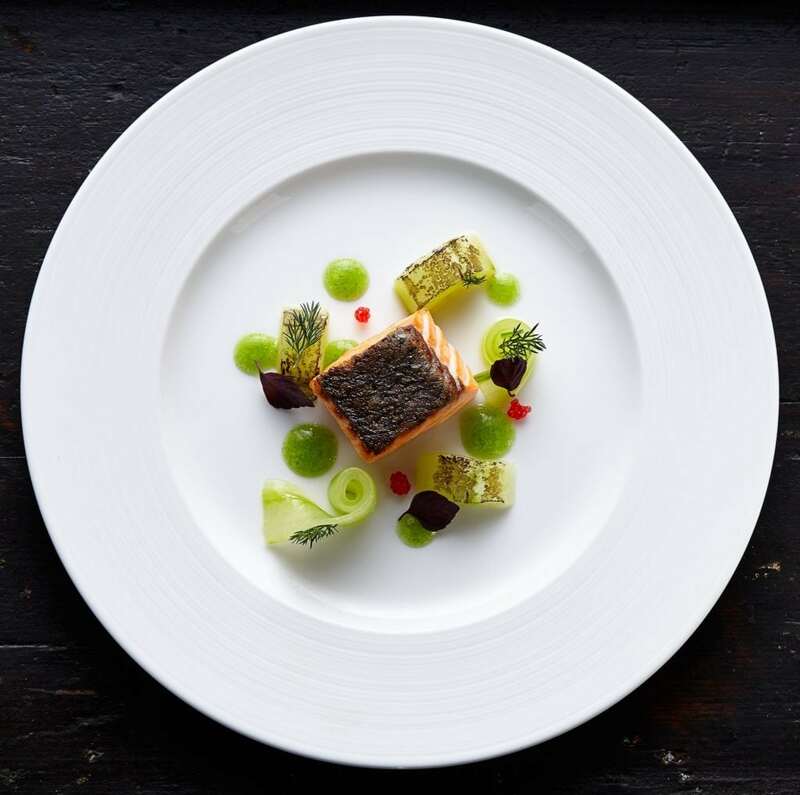 Place the salmon portion in the centre of the plate, arrange the grilled cucumber around the salmon, adding the dill and drops of salmon roe around the plate. Put the cucumber consommé into a small pouring jug and pour a little around the salmon in front of your guests. If available, you can also create a cucumber gel for the plate by blending an additional cucumber with a pinch of salt and a teaspoon of xantham gum, place in a piping bag and pipe different sized dots around the plate for additional texture.